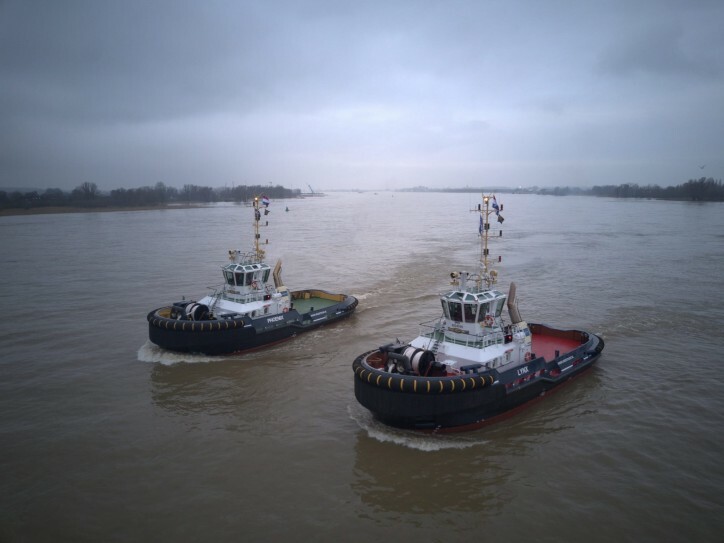 Iskes Towage & Salvage, the leading maritime service provider based in the port of IJmuiden / Amsterdam, has taken delivery of two Damen ASD Tugs 2810. The vessels were built at Damen Song Cam Shipyards, Vietnam, and delivered last year to Damen Shipyards Gorinchem, the Netherlands, as part of the group’s strategy to position stock vessels for rapid availability in Europe. This on-demand availability was a significant factor in Damen winning the contract, with both tugs being delivered within two weeks of the contract being signed. Named Phoenix and Lynx, the tugs are essentially standard versions of this best-selling model. 28-metres in length, they have a bollard pull of 60 tonnes, a top speed of 13 knots, and excellent manoeuvrability and seakeeping. This makes them ideal for a wide range of duties including vessel handling, offshore supply duties and ship-to-ship transfers. Some minor modifications were made prior to delivery in line with Iskes’ standard requirements.